Okay, my friend Tracy really wanted this recipe and asked to see it in a blog. Really, she asked me to start a blog. And I guess most of my friends don't know that I actually already have one. If I knew people were actually reading it, I would do my best to post recipes at least two to three times a week. So here it goes. With me starting to put my blog more out there ... Indonesian Style Fried Rice. The first interesting thing I needed to tackle was, what if I don't have any cooked or leftover rice? So I asked, what makes rice seem like leftover rice? It's usually firm and chewy, right? 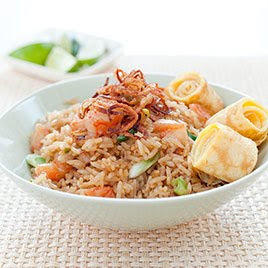 Firstly, take 2 cups of your favorite white style rice like a long grain or jasmine rice. Rinse until the water runs clear. Drain. Then take a 12" pan and heat some olive oil in it at medium heat. Be careful when you add the rice to the pan, wait until the oil is hot but not at it's smoke point. Since the rice is a little wet it will sizzle and may sputter at you. Stir often coating the rice in oil. Be sure you do this until the rice is toasted and all the water is evaporated. Add more oil if necessary. I use about 2 to 3 turns of the pan, about 2 tablespoons. I'd stick with 1 tablespoon of oil to 1 cup of rice but that is up to you. Reduce temperature to low. Carefully add 2 2/3 cups water. Increase temperature and heat until boiling, stirring occasionally. Once brought to a boil, reduce heat, cover and simmer for 18 minutes, or until all of the water is evaporated. I made sure not to remove the rice from the pan until the bottom was a bit toasted and the rice released easily. Next, put all the rice on a cookie sheet or jelly roll pan and spread out. At this point I placed the pan in the oven without it turned on, so that the rice could cool. You can also achieve this on your counter, but make sure to put a cooling rack underneath the cookie sheet. It should be cool enough in 10 minutes or so, and at this point you can place the rice in the refrigerator for 20 minutes. I just left my rice in the oven for a couple of hours till I was ready to make the Fried Rice. Using less water and toasting the rice will mimic day old rice. Okay, so now we have our rice. Or lucky you! You found this recipe when you want to use leftover rice! 1. Pulse chiles, 4 shallots, and garlic in food processor until coarse paste is formed, about fifteen 1 second pulses, scraping down sides of bowl as necessary. Transfer mixture to small bowl and set aside. In second small bowl, stir together brown sugar, molasses, soy sauce, fish sauce, and 1¼ teaspoons salt. Whisk 3 eggs and ¼ teaspoon salt together in medium bowl. 2. Thinly slice remaining 3 shallots and place in 12-inch nonstick skillet with oil. Fry over medium heat, stirring constantly, until shallots are golden and crisp, 6 to 10 minutes. Using slotted spoon, transfer shallots to paper towel–lined plate and season with salt to taste. Pour off oil and reserve. Wipe out skillet with paper towels. 3. Heat 1 teaspoon reserved oil in now-empty skillet over medium heat until shimmering. Add half of whipped eggs to skillet, gently tilting pan to evenly coat bottom. Cover and cook until bottom of omelet is spotty golden brown and top is just set, about 1½ minutes. Slide omelet onto cutting board and gently roll up into tight log. Using sharp knife, cut log crosswise into 1-inch segments (leaving segments rolled). Repeat with another teaspoon reserved oil and remaining egg whipped eggs. Repeat all of step  with the other 3 eggs. 4. Remove rice from refrigerator and break up any large clumps with fingers. Heat 3 tablespoons reserved oil in now-empty skillet over medium heat until just shimmering (add more if necessary to make 3 tablespoons). Add chile mixture and cook until mixture turns golden, 3 to 5 minutes. Add shrimp, increase heat to medium-high, and cook, stirring constantly, until exterior of shrimp is just opaque, about 2 minutes. Push shrimp to sides of skillet to clear center; stir molasses mixture to recombine and pour into center of skillet. When molasses mixture bubbles, add rice and cook, stirring and folding constantly, until shrimp is cooked, rice is heated through, and mixture is evenly coated, about 3 minutes. Stir in scallions, remove from heat, and transfer to serving platter. Squeeze 1 lime juiced into rice. Garnish with egg segments, fried shallots, and lime wedges; serve immediately.